FOREWORD: Though I’d spoken to Come boss, Thalia Zadek, and right-hand axe man, Chris Brokaw, several times before (at the Mercury Lounge and other venues), this 1997 interview at a Chelsea café in Manhattan was our first ‘sitdown.’ Zedek had worked her way up the alt-rock no wave ladder through formative bands such as Dangerous Birds, Uzi, and Live Skull, releasing a few solo albums after Come disbanded in ’99. Chris Brokaw, former Codeine drummer, made over a half-dozen hard-to-find but easy-to-love and anything-but-compromising solo albums, including ‘05s truly superb Incredible Love. His live show at Maxwells in Hoboken during ’08 was one of my favorite events of the year. This article originally appeared in HITS magazine. Baseball legend Babe Ruth grew up in Baltimore and reached Hall of Fame status playing for the Boston Red Sox and New York Yankees. Similarly, venerable tortured artist, Thalia Zadek, was raised in Baltimore, then settled in Boston after gaining initial credibility playing New York’s Lower East Side. She lent her formidable talents to cult faves Uzi and Dangerous Birds during the ‘80s. Along with Scarsdale, New York native and co-guitarist Chris Brokaw, they formed the critically acclaimed band, Come, recording audacious debut, 11:11 in ’92, and its respectable follow-up, “Don’t Ask Don’t Tell” two years later. With bassist Sean O’Brien and drummer Arthur Johnson in tow, they also backed former Dream Syndicate leader Steve Wynn on ‘96s Melting In The Dark. I spoke to Zedek and Brokaw at a Chelsea diner. Legend has it they picked up the check. How did you come up with Near Life Experience’s twisted title? THALIA: The title refers to a slip of the tongue. I was telling someone I had a ‘near life experience,’ but meant to say near death experience.. Chris was cracking up at the imagery of that. How has your music developed over the years? THALIA: The Dangerous Birds were very poppy. We had a lot of different ideas. But I got into straight punk afterwards. I began to like the unstructured music of the Birthday Party, which was similar to punk if you tore it apart. How can artists maintain critical acclaim when impending popularity offers the chance to sell out? THALIA: I think music that is really original will get popular. Musicians aren’t doing themselves a favor by jumping on a trend because trends change. If you make stuff that’s interesting and original while trying to express yourself rather than copy someone else, it’ll be appreciated. You may not be a superstar, but you’ll get an audience. It doesn’t make sense to me how people pander and sell out because if you lose credibility and integrity, there really isn’t much else. I like different types of music. But I’m always baffled by what gets popular. What current band annoys you? THALIA: Everclear strikes me as writing incredibly stupid songs. They get on my nerves and make me want to cringe. I like catchy songs with good melodies, like Oasis, but I don’t get into their silly lyrics. What’s the first record you ever owned? THALIA: Either “Kung Fu Fighting” or the Carpenters “Top Of The World.” I actually didn’t buy much music later on. The first musician I was really into was Bob Dylan. I remember Leonard Cohen. I love his song, “Suzanne.” I discovered more of his music later on. The gloomy despair of your first two albums seems not as prominently displayed on Near Life Experience. Do you have a happier outlook? THALIA: I don’t have a more satisfied outlook. But my outlook has changed. I can’t pinpoint what happened, but after 11:11 and Don’t Ask Don’t Tell, we tried to show some variety by not having just a single mood. Instead, we’d write five slow songs and then there would be one fast one thrown in. 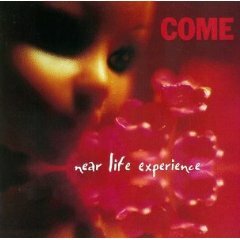 The cover art for Near Life Experience seems to imply a reawakened innocence. What made you want to pursue music, Chris? CHRIS: My dad used to play drums. He once sat in for Jerry Lee Lewis. It was a fluke. He went to see him play at a roadhouse in Indiana and his drummer never showed up. He got paid and did a few sets. Do you feel restrained being in a backup role to Thalia? CHRIS: The main reason I play with Thalia is she’s a really good guitarist. Our friends introduced us and we played for hours. It was a great situation because we had a good musical dialogue. And she’s a great lyricist and singer. I’ve always trusted her judgement, even when she puts my music into words. The attention may be on her, but so is the pressure. Our stuff isn’t exuberantly happy so the press picks on Thalia, which is a relief. What’s the difference between touring Europe and touring the States? CHRIS: In Europe, they want you to play for a long time. It’s something they speak very highly of. My friends saw Guided By Voices in Berlin and they did five encores. In the States, they’d say that’s enough. But Europeans seem to have a longer attention span. CHRIS: I was reading Please Kill Me by Legs McNeil. It had quotes from several late ‘70s punk bands which I realize influenced me. New York Dolls. Richard Hell. Iggy Pop, the Contortions, Public Image Ltd. And Bush Tetras. But lately, I’ve been listening to Charles Mingus and other Jazz artists. What are the first records you owned? FOREWORD: I always had utmost respect for Thalia Zedek, former leader of caliginous Boston combo, Come. And I’ve met her on several occasions. There were Maxwells shows fronting Come and backing Steve Wynn and a few interviews between. She went solo when I conducted the following interview in ’01. Since then, she’s released ‘04s wordily scrabbled Trust Not Those In Whom Without Some Touch Of Madness and ‘08s better Liars And Prayers. This article originally appeared in Aquarian Weekly. After four dark-hued, long-playing diamonds in the rough as leader of Boston band Come, Thalia Zedek assembled a few talented local friends for her haunting solo debut. Another hard luck, despair-ridden psychotic journey into the dank duskiness of a desolate, whiskey-soaked urban evening, Been Here And Gone invokes seamy, archival folk mysteries without getting over-indulgent. Whether intentional or not, Zedek’s gravelly, cigarette-stained opening salvo, ‘everybody knows’ (from the cryptic “Excommunications”) quotes a song title from her mentor Leonard Cohen’s ‘80s comeback, I’m Your Man. That sense of hard-fought survival continues through the long distance sendoff “Strong” and the redemptive “Treacherous Thing” before drifting into Cohen’s own “Dance Me to the End of Love” (which spins into a circular gypsy waltz perfectly suited to beatnik troubadour Tom Waits). Pianist Beth Heinberg (who’d played on Come’s Near Life Experience and Gently, Down The Stream) gives a stripped down cabaret-styled melancholia to the stormy moodiness of re-visited compositions “1926″ and “Manha de Carnaval” while David Michael Curry’s plaintive viola provides an eerie beauty to several numbers. Perhaps only Bad Seed frontman Nick Cave and post-suicidal Marianne Faithfull could plunder into cracked romantic obsessions and broken-hearted premonitions with such fervor. To add an ominous afterthought, Zedek took a bus to NYC on the day of the WTC attacks. Since there was no access to Manhattan and Brooklyn, she was left off at the 3rd Street Bridge and had to walk into the temporarily crippled Cultural Capitol of the World. I thought Been Here And Gone had a bleak literary darkness reminiscent of Tom Waits. 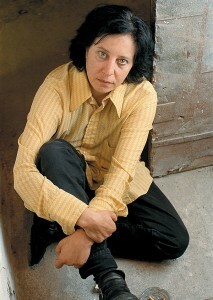 THALIA ZEDEK: I took time off, did solo shows, and sang in different styles with different people. There’d be piano or viola accompaniment and we’d do covers. I started writing songs for those arrangements and there was more room for vocals and melodies rather than guitar riffs. That was hard to do with Come. We had quiet stuff, but I had a better chance to do more with that. I wasn’t listening to Tom Waits, but instead, quieter stuff like Chet Baker. This album fits in well with low key fare by Spain and Low. Your cover of “1926″ reminded me of the somber album Patti Smith did after the death of her husband, Fred ‘Sonic’ Smith in the mid-’90s. THALIA: Yeah… Gary Gogel wrote “1926.” He’s from Boston and had an early ‘80s band, Vee, that put out a 4-song EP before breaking up. Their singer was Susan Anway, who was the first Magnetic Fields singer. They were great. I always loved that song. I sent Gary a copy of my cover. THALIA: I had never heard his original studio recording on Various Positions until after we made the record. But I took it from a live arrangement he did on a European tour. On “Temporary Guest,” David Curry’s viola arrangement reminded me of the work Jane Scarpantoni did on Dylan’s Desire. THALIA: David Michael Curry is a guy from Boston I’ve been playing with. He’s now on tour in Europe with Boxhead Ensemble. He’s done stuff with Will Oldham. I play clarinet in his band Empty House Co-Operative, an improvisational group. He also plays full time in Willard Grant Conspiracy. He’s a good friend who’s extremely talented. He plays trumpet, viola, and guitar. Who’s Louise Banfa, the composer of “Manha De Carnaval”? THALIA: That was written a long time ago for this Brazilian movie, Black Orpheus. It came out around 1958. It’s a well-known song Frank Sinatra, Tony Bennett, and many Latin singers covered. It’s a Latin standard. Beth is usually an accompanist so she had the sheet music. I said, “Why don’t you pick a new cover.” Then, we discovered how popular it was.